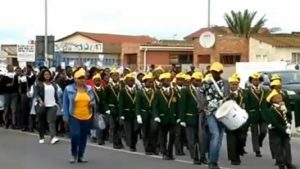 Schools from Port Elizabeth townships took time off Thursday to commemorate the sinking of the SS Mendi. Pupils walked from the Mendi Memorial in New Brighton to the Nangoza Jebe Community Hall where a screening of the film “the SS Mendi” took place. The SS Mendi was a British steamship which sank in 1917 in the English Channel after colliding with the SS Darro. 600 troops died, most of them from South Africa. The pupils, mainly from New Brighton, were jovial, singing songs remembering the fallen South Africans. It may have been a day off from school but it was an educational one. The pupils watched the film SS Mendi and a stage production. “We have learned a lot from today (Thursday). SS Mendi is so inspirational, and we should be taught about it at schools. The screening and plays were so entertaining,” says learner Thandolwethu Tshabalala. There are different narratives around the SS MendI. However, Zwai Mgijima has travelled to England and France, doing research on its history. He also wants it to be included in schools’ history curriculum. “Well artists or writers need to learn to write their own stories, otherwise they will be deviated. Historians have not yet done their work , a lot of information has been hidden that is why its fundamental for them to know what happened in 1917, government needs to assist us were possible ,” says Project Manager Zwai Mgijima. The plan is to go bigger next year. The organisers hope to raise more funding to attract other schools from across the metro to the commemoration. The post PE schools commemorate SS Mendi appeared first on SABC News – Breaking news, special reports, world, business, sport coverage of all South African current events. Africa's news leader..